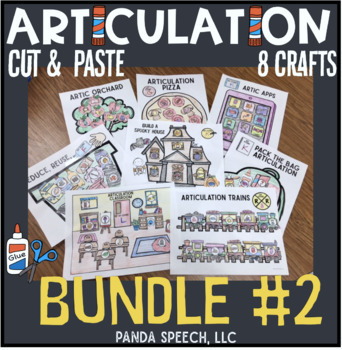 ✂️ Your students will love making these crafts while practicing their sounds! These resources were designed to be simple, no-prep activities to target articulation any time of the year. They are simple cut and paste crafts! 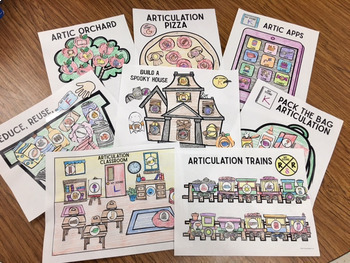 Perfect for k-5 (some younger students may need cutting assistance, depending on fine motor abilities).New easy cut versions added for the following packs: apple orchard, pizza, pack the bag, trains, recycling, and clasroom. Save $$$ with this bundle! It is like buying 7 and getting one FREE! ⭐ Please Note: This bundle is included in my Mega Bundle with every craft available in my store (currently 24). Click here to check out the Every Craft MEGA Bundle Do not buy this if you own the Mega Bundle or one of the individual packs! This bundle includes the following crafts (click on the links to see each one individual) Don't buy this bundle if you have purchased some of the products listed below! 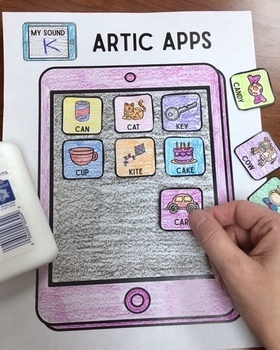 Your students will love making these crafts while practicing their sounds! These activities were designed to be a simple, no-prep way to target articulation. They are simple cut and paste crafts! 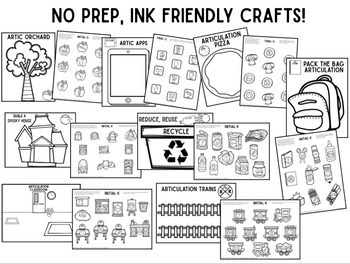 Perfect for k-5 (some of the younger students may need cutting assistance, depending on fine motor abilities). Each craft includes these commonly targeted phonemes (does not include all phonemes). I also included guides that can be used as a coloring page too! Table of contents/page guides included to make finding the page you need easy! Did you know I have Articulation Thumbprint Art activies? ARTIC SWAT! EWWW flies have landed all over the food! Squish them with play dough or swat them with fly swatters while your practice articulation! ARTIC POP! Pop balloons as your practice articulation!